Born in Manchester, England on April 1, 1842, William Lees Judson immigrated to the U.S. with his family in 1852. He was educated in the public schools of Brooklyn and Ontario, Canada. He enlisted in the U.S. Army during the Civil War and afterwards spent several years as a farmer in Ontario. He studied art in New York City with John B. Irving (1872-73) followed by three years in Paris at Académie Julian under Jules Lefebvre and Gustave Boulanger. Returning from Europe, Judson worked in New York City, Toronto and London, Canada until 1890 when he moved to Chicago where he was active as a portraitist. After the Chicago World’s Fair, he moved to southern California where he taught at the Los Angeles School of Art & Design. Judson was an art professor at USC from 1896-1901 and in 1901 founded the USC College of Fine Arts. He was Dean of that school until his death in Los Angeles on Oct. 26, 1928. His oeuvre includes landscapes, coastal scenes, missions, and Indian subjects in oil and watercolor. He was also the originator of the Craftsman movement in the Arroyo Seco of Pasadena. Exhibitions: London, 1886 (bronze medal); Thurber Gallery (Chicago), 1891; San Francisco Art Association, 1891-1916; California Midwinter Expo, 1894; Los Angeles Art Association, 1894; Chamber of Commerce (LA), 1894; California State Fair, 1899, 1900; Blanchard Gallery (LA), 1900; Ruskin Art Club (LA), 1902-04; USC, 1907, 1910; Alaska-Yukon Expo (Seattle), 1909; Steckel Gallery (LA), 1913, 1914; Friday Morning Club (LA), 1913; California Art Club, 1914-27; Panama-California Expo (San Diego), 1915 (bronze medal); Daniell Gallery (LA), 1916; Battey Gallery (Pasadena), 1917; Calif. Liberty Fair, 1918; LACMA, 1918 (solo); Painters & Sculptors of LA, 1920-25; Southwest Museum (LA), 1921 (prize); Kanst Gallery (LA), 1922; Artland Club (LA), 1927; Artists of So. Calif., 1930. Bowers Museum (Santa Ana); Irvine (CA) Museum; Orange Co. (CA) Museum. 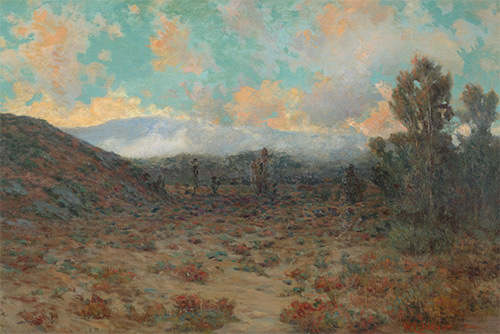 Artists of the American West (Samuels); Southern California Artists (Nancy Moure); California Impressionism (Wm. Gerdts & Will South); Dictionary of American Painters, Sculptors & Engravers(Fielding, Mantle); Dictionnaire des Peintres, Sculpteurs, Dessinateurs, et Graveurs (Bénézit, E); American Art Annual 1929; Out West, May 1913; California Design 1910; Los Angeles Times, 10-27-1928 (obituary).